Fig. 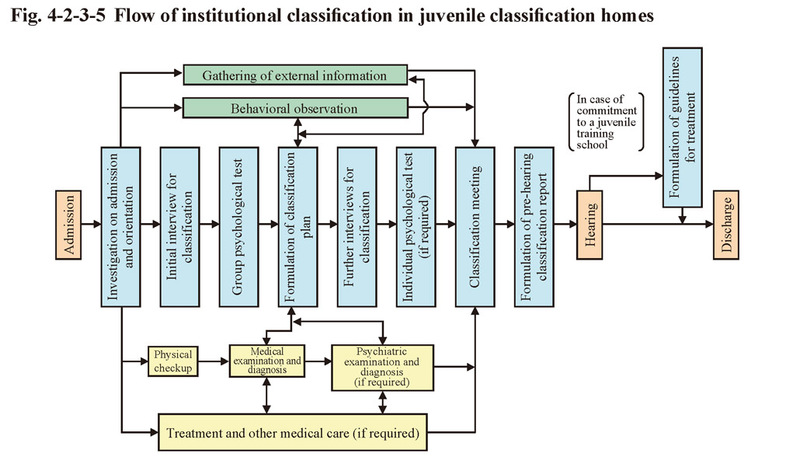 4-2-3-5 shows the standard flow of classifications of juveniles for whom a decision of protective detention (commitment to a juvenile classification home) was made (institutional classification). Whether to place a juvenile under community-based protective measure (probation, etc.) or institutional protective measure (commitment to a juvenile training school, etc. ), etc. is determined (classification determination) based on the results of classification interviews, psychological tests, behavioral observations, and medical diagnosis, as well as external information. 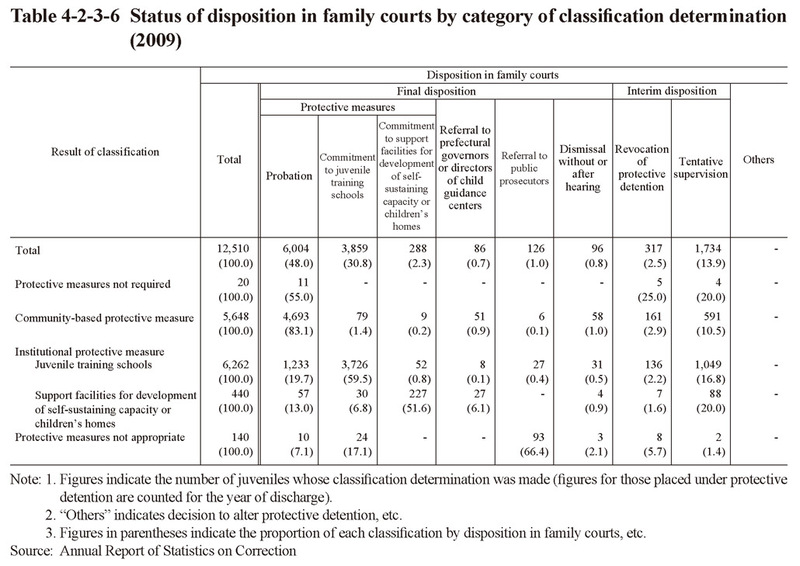 The result of the classification is then recorded in a report along with the characteristics of the juvenile's predisposition, factors that may have led them into delinquency, and guidelines for use in their reformation/rehabilitation, which is then sent to a family court as data used in the hearing. If a disposition of protective measures is decided, the result of the classification is also sent to the juvenile training school or probation office for use as reference material in the juvenile's subsequent treatment. 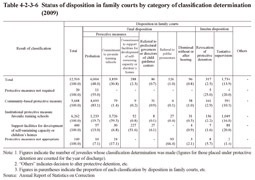 Table 4-2-3-6 shows the relationship between the classification determination and disposition in family courts, etc. of juveniles whose classification determination was completed (only those placed under protective measures were totaled for the year of their discharge) in 2009. Although institutional classifications take place for most cases dealt with by family courts, classifications can also take place by summoning juveniles to a family court or juvenile classification home, etc. without accommodating them at a juvenile classification home. In 2009, 232 juveniles received classifications without physical restraint (Source: Annual Report of Statistics on Correction). The number of persons received for classification at the request of a relevant Ministry of Justice agency in 2009 was four from public prosecutors offices, 3,359 from juvenile training schools or penal institutions, and 4,347 from Regional Parole Boards or probation offices (Source: Annual Report of Statistics on Correction). The classification activities that took place in response to a request included classification of the subjects' predisposition, individual or group psychological tests, and interviews and enquiries, etc. conducive to formulating or changing the treatment plans, etc. for them. Classification services for the general public can take place upon request from public/private organizations, etc. The content of those consultations is of a wide-range and can include not only delinquency but also juveniles' characters, discipline, and necessary student guidance, etc.